Here is the ever growing product list. This module is an envelope generator. It offers Attack, Decay, Sustain, Release, and a 'time' knob to alter the length of the stage or 'loop'. You use this module to control other modules, for example: VCA's, VCO's pitch, Filter's. When in loop mode, the output is audible. Control Knobs: Attack, Decay, Sustain, Release, Time. Switches; Linear or Exponential mode. There is also a switch for Normal one pass, Gated mode, or Loop mode. Gated mode is like loop mode but it will only cycle with a gate signal patched up. Outputs: (2) simultaneous envelope outs. Inputs: (1) Gate or Trigger input, there is a passive thru jack for you to keep daisy chaining the gate patch to other envelope generator, (1) CV input with level CV knob to voltage control the envelope output level. This Module lets you integrate some preset arpeggio patterns to your modular to control vco's, etc. 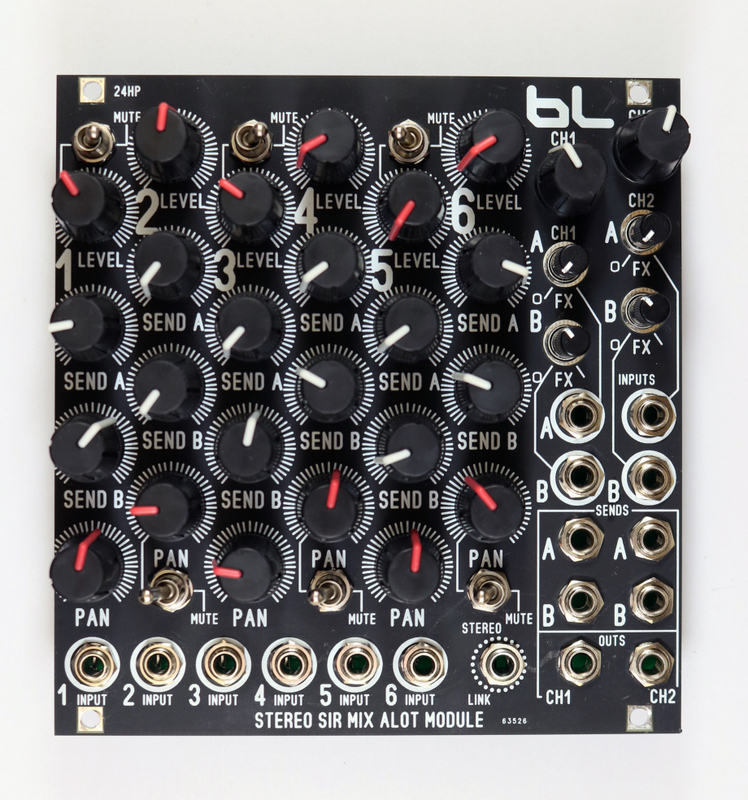 This is a module based on Michael Barton's Arpeggiator Firmware PIC project. You can find the reference manual for this module here. There is CV for all the knobs. Here is some information taken from the Michael Barton pdf. displays the various modes of movement available at what voltages on pin 18. 3.6-4.2V Down and stay Top of note set Holds note until reset. This module contains two of the same circuit. It is a discrete transistor based oscillator with range switch capable of doing LFO duties also. This circuit is based on the Berfotron advance vco, which is based on a buchla influenced design. This is a triangle core oscillator. Multiple waveshape outputs with in-depending volume control. Wide variety of modulation inputs for complex control. Dual module has twice the functionality. Both VCLFOs work great as audio range oscillators. unique triangle core sync circuit, found on the LMC and PTC VCO's also. This module is used for mixing signals. You can for example use it with multiple vco's to create chords or complex voltage control mixes for another module. It is also most commonly used right before an analog filter. This particular mixer has mute toggle switches, the ability to daisy chain more than one SIR MIX A LOT module, and DC or AC coupling on the signal path. The LED's indicate 10v-pp wave signal output. This is an analog filter that uses a 10 stage diode core influenced by N. Steiner's synthacon vcf. You get Low pass, Band pass, and High pass inputs. All of them can be used at the same time to mix different vco's. The band pass section is what really makes this filter shine. Some blue lantern improvements include dc removal on the rez circuit, jfet power coupling, and precision trimmers for cutoff and rez. Through hole polyester film capacitors were used for the filter. Does this filter make all the screechy warble like all the other Steiner VCF's out there? It can if you like that, but I ship it out tamed and very musical. There is a 25 turn trimpot on the back where you can fine adjust exactly how far you want to push the feedback resonance. This design I have does not contain the common dirty pot troubleshoot most people complain about. The inputs also have a switch jack design to quiet any input jack not in use. If you missed out on the first generation modules I released, here is your chance to see what all the fuss was about. This is another analog lfo made specifically for new clients who are on a really tight budget. I am offering a mini series called the 'Simple Series', which gives you the basics. 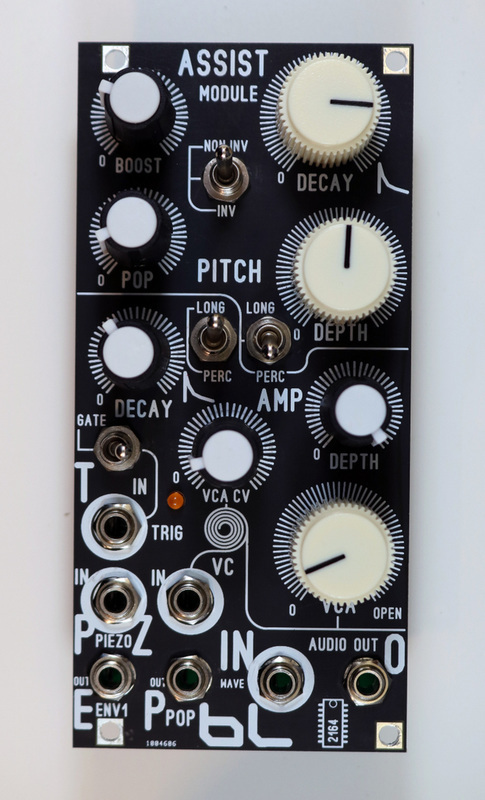 So this particular module is good for modulating your filter module or vco module for example. There are 3 square wave oscillators that ring mod each other twice to produce 'shimmery' sounding tones or drones. The internal sound does not stop. When you patch from the 'drone' jack it is a constant sound. You use the A, B, and C knobs to tune each individual oscillator. Then you use the 'Tune' Knob to adjust all of the oscillators when you find that perfect sound. To the right of the module contains a TR influenced circuit that uses the abrupt dirty transistor vca to produce hi-hats or metallic percussion. I added the essential accent control to vary the amplitude. You need a gate or trigger signal from an lfo, etc, to activate the TR VCA portion of the module. Otherwise if you want clean hi-fi sounding percussion from this unit, you patch from the 'Drone' jack to your hi quality ssm2164, or cool audio v2164 vca. The Blue Lantern Modules Stereoscopic VCA, and Hexagon VCA can be used for example. You would also need a envelope generator to complete the patch. The Blue Lantern Modules Simple ADSR can be used. Controls: Gate Threshold, Slope Detector Sense, Pre Amp booster level. Circuits involved: Line Level to Synth Level pre-amp. Slope detector, Gate Extractor, Audio to Voltage converter. Each of these are x2 for stereo or two channel operation. Gate Extractor is rated at 10v output. It goes from -0.7v to 10v per pulse. This makes it compatible with a wide variety of stuff out there. If this signal is too strong you can use the blue lantern attenuator for finer control. The gate extractor and audio to cv converter is influenced by a selector switch which chooses three possible capacitors: 1nf, 220nf, and 56nf. This module is used to amplify line level to synth level signals. You can do stereo since there is two channels. Internally the pre-amp is routed after the pre-amp to a gate extractor, envelope follower, and audio to cv converter. The cv converter is not 1v/ per octave, it is used more as a modulation source for your vco's or lfo's, etc. There is a separate slope detector circuit that requires you to patch an input. You would patch here the envelope follower output, or triangle wave is good. You are free to experiment as this circuit will detect a raise, high state, and fall of a signal. It then extracts a gate signal on the output jacks. Controls: 4 Knobs to mix in 4 divided sub harmonics. What you will hear with your gear is one supper fat mixture of harmonics. You have 4 knobs to mix in each harmonic. The module can handle a full wide frequency spectrum. The module is using CD4013 Flip Flop IC to do it's 4 divider break down. There is no latency, no Atmega or STM shinanigans. Take a look at the oscilloscope pictures. I sampled a saw wave, and square wave from a Simple Saw Core VCO and patched it into the Sub Generator module. Still not convinced, did I mention it is $68.50? The diode operator station is an analog filter based on the steiner diode array. 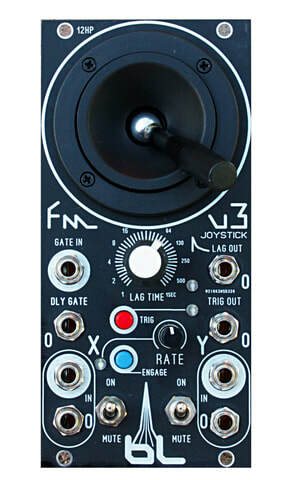 you patch a ‘sound’ module like a vco or noise generator into one of the input jacks. you then use the big knob to filter out frequencies and become a star. there is an on board vca internally connected to the final output. the vca is turned fully counter clockwise for normal operation. This will allow sound to pass 100%. when you would like to use the module for regular mono synth action you turn the vca knob until the sound is ‘closed’ or gated. simply patch an envelope generator to the ‘cv’ input and turn up the knob. An envelope generator will open the vca. There is also an output 3.5mm line level stereo jack that you can use to record straight to your daw using a Y-cable. Controls: cutoff knob, rez knob, bi-polar fm knob, mixable lp, bp, hp level knobs, charm knob for wavefolder variation and a vca with cv level. Type: 12db lp,bp,hp mixable analog filter and diode wave folder. (1) analog steiner based vcf, (1) v2164 linear hi-fi vca, (1) diode based 8 stage wave folder, (1) synth level to line level converter. The simple vco is a low cost, saw core oscillator. it also makes a fine low cost option to add an animated super saw to your rig. This module was influenced using articles found in electronotes, by burnie hutchins. Precision reference voltages were used for the tune, fine, and pulse width control. Wave outputs: saw wave, variable square wave, variable super ramp wave. For the core vco: tune knob, fine knob, bipolar fm cv, dc mod knob, pulse width control & pwm control. For the super saw: shaper knob and lfo input attenuation. You use the knobs to select the different scales. This module is a 12db analog filter using LM13700 OTA chip. The module contains the following circuits: Main OTA VCF, Diode based Wave Folder, 2 level Sub harmonic Generator, Pinging system, and a line level converter. There is a Lowpass and Highpass mode. The PING is used to create percussive sounds using the filter's self oscillation function. To use this correctly you setup the REZ knob right before self oscillation. Then you patch a trigger or gate signal into the 'PING' jack. You use the Audio knob to input the level of the PING. It is best to not have any other signal on the input jack when trying to create percussive sounds using the pinging system. Once you get use to making percussive sounds, now patch from the 'out' jack into the Charm Input, and use the Charm Out to hear the results. You will like what you hear. It is now doing FM percussive sounding effects. Use the Charm Knob to adjust. Out of all the other Blue Lantern VCF's that contain a Pinging System Circuit, the Space Moth wins hands down. It was made for this. The filter itself has a massive low end. When used for filtering duties you can also patch a square wave into the 'sub in' jack to add some 2 level sub harmonics. use the SUB knob to mix in. This is a nice small joystick to add some control to your modular. The joystick is acting as an attenue-inverter. At center position is zero. Swinging the joystick side to side gives + or -. There are two attenue-inverters, one for each axis. When nothing is patched into the 'input' jack, the joystick is using an internal reference voltage (7v). You can use that to control a fitler module for example. When you patch a vco or lfo into the input jack you can add some fm to another external vco and have control over the FM with the Joystick. The joystick also has a push button. The gate out jack allow you to trigger your other modules that don't have manual trigger control. This is an analog noise generator using a transistor to generate white noise. The other noise flavors are achieved using capacitor filtering. These flavors are: White Noise, Low Pass White Noise, High Pass White Noise, Red Noise. You use the Noise generator to create hi hats, ocean wave sounds, and add some random voltage to your modular. There is a trimmer on the back of the module to adjust the loudness of the core white noise. Below those jacks is the Lock hart Wave Folder circuit. Use a Triangle wave or Sine Wave for best results. The folding is influenced by the level of the wave inputted. So a VCA or attenuator would come handy for fine controlling the folding effect. The last circuit on the bottom converts signals into a trigger pulse. Core Type: Triangle. Uses discrete transistor core design. The transistors are all on the same IC, very stable design. Surface Mount parts. Influenced from the Bergfotron Advanced VCO circuit, which is influenced from an old buchla vco. This module is used to generate 1v/octave wave shapes: sine, triange, saw, even harmonic wave, square wave, and ramp wave. It is the bread and butter module for your system. Use this to get some audio sound generated. There is a toggle switch on the top to turn the vco into an LFO. In LFO mode the module has very fine control over the lfo speed. The most common waves have there own level output knobs. I did this because this module compliments another Blue Lantern VCO called the PTC VCO. By having level control on the waves it gives you finer control for FM duties. Since this is Triangle core the sync is to die for. It sounds very quantizer like and incredible. I have yet to hear this on other Euro Format vco's out their. The sync knob is used to adjust how strong of a sync effect you want. PCV jacks are used for the pitch cv control. 1v/octave. The Lunar Modulation Center MK2 has a step wave generator. You patch a wave signal into it and it will reduce it into steps. There is a control the width and you can CV control that. The sound is better then traditional pulse width modulation. The MK2 version also has level attenuation of the square wave output. This module will turn a mono euro format "synth" signal into stereo channels with line level outputs (3.5mm jacks). It will also allow for send and return of a stereo fx external unit. There are level knobs for the send and return to get the volume just right. The master knobs on the top adjust the final line level output signals. The module can function as a headphone monitoring module when you don't have an external mixer or speaker amp. on hand also. The master level knobs on the top adjust the headphone levels. There is no dedicated headphone knob, so if you are recording from this module to your DAW you would have the master knobs just about fully clockwise, making the headphone amp loud. The headphone feature in this case would not be used. This module is a ring modulation effect that is based on old arp odyssey circuitry with a twist. On the original it only mixed pulse waves internally. On my version you can adjust from pulse to triangular waves. Think of it like a tone control. Th operation of this product is easy. You patch any wave into "A" and another wave into "B". It is best to use separate vco's or noise sources tuned at different frequencies. You then hear the effect out of the bottom jack "cmos ring mod". This is an analog filter based on the polivoks vcf. This particular design uses the programmable LM4250 IC op amp to do it's filtering. There are some additional circuits not found on the classic original. The brite and dark switch is one of them. It allows for some decimator sounding timbres. There is also a diode limiter to allow the user to explore very high resonance settings. This is selected by switch also. Controls: Cutoff, Rez, Bi-polar FM modulation, and Audio Input level. Jack inputs: (2) CV direct jacks, FM input, and Audio input. Jack Ouputs: Low pass filter, band Pass filter. This module has a triangle core VCO generator specifically setup for lfo duties. There are four outputs each with different phase shifts: 0 degree, 90 degree, 180 degree, and 270 degree. Each output has it's own level knob and there are four colorful leds to give rate frequency visual feedback. The LFO has a frequency control knob and fine tune knob. There are two possible CV inputs. One of them is direct and the other labled 'MOD' has it's own input attenuator. Analog Filter, Can easily get Brutal tones. This is an analog filter that uses two modern equivalent ssm2164 IC's v2164 from cool audio to do it's magic. This particular filter however allows the user to vary the phase of each pole or filter cell. There are four filter cells total. This is similar to the Blue lantern Asteroid Operator Station VCF. The Asteroid Operator Station VCF has 8 Static filter out puts. Those 8 flavors were found by exploring the circuit found on the millipede vcf and internally installing the resistor ratio for that flavor. On the millipede vcf you are allowed to find more exotic flavors yourself. Operation is easy. You first have all the poles counter clockwise and the three switches set to mute. This will have the filter as a dark Low pass filter. Then you turn on a pole using the switch and turn the know to hear the change. Pole 3 by default is always on, otherwise there would have been no sound if all poles were muted. Having all the poles set clockwise and active easily gets you into brutal sounding tones in a good way. There is an on board diode limiter circuit to help tame really harsh tones. This is activated by switch. The audio input has some gain, so you don't always have it fully clockwise. There is also a capacitor selector switch just like my other filters. This modifies the rez peak. This is an analog filter that uses four surface mount quad transistor IC's to build a discrete classic transistor ladder circuit. It has a 24db low pass output. The resonance does not have any internal signal compensation on the feedback path, how ever there is plenty of gain on the audio input so you just have to turn it up if you want compensation. This filter sounds really good, and at a great price. There is no Bi-polar FM circuit on this one. Sorry it did not fit on the pcb. No big deal there are still two CV sources, each with dedicated level knobs. Signal Levels for In/Outs: modular synth levels -5/+5. 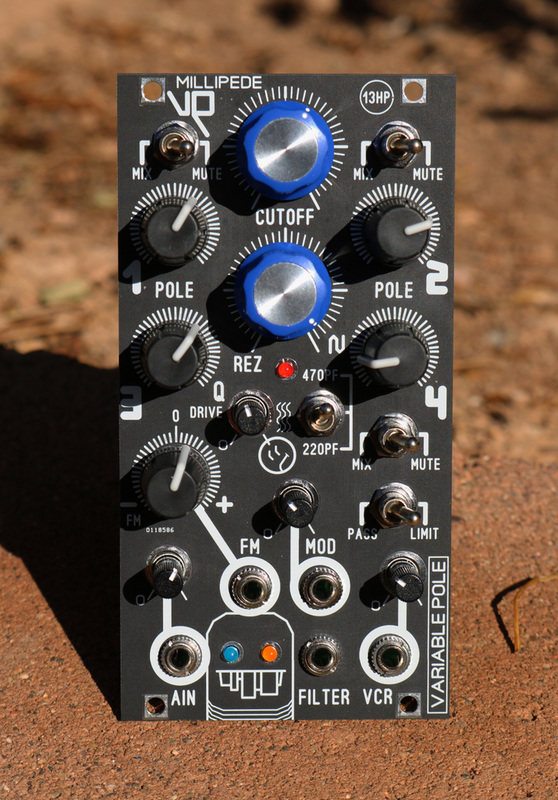 This module has two echo delay effect circuits based on the Dwarf Star Semi Modular system. With this module you can add cool delay fx to synth level signals. Each of the parameters has CV control with their own attenuators. There are three parameters per channel. The two echo fx circuits are mirrored on the front panel: Channel A and Channel B. The fx processing was fine tuned for clean fx processing. When the feedback is fully clockwise it will not go into trashy garbage. You can however patch a cv input into the 'REPEAT' parameter, have the RCV attenuator fully clockwise, and force it to feedback into loud trash. There is no switch jack on the input jacks. However, all the CV jacks have switch jack internal connections. This allows you to modulated both channels using only the the Channel A side. 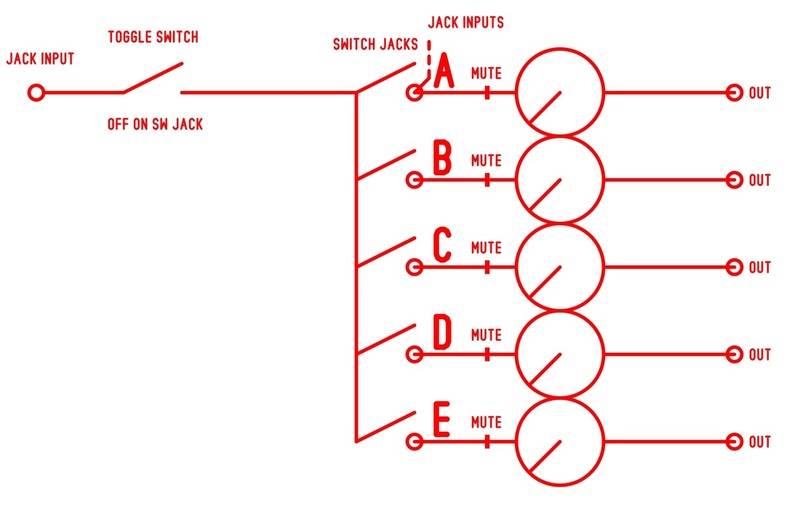 For true independent patching on each separate channel simple patch something into the corresponding Channel B jack. The Kill toggle switches kill the dry signal input going into the pt2399 fx chip. It will however allow echo trails to keep going until they die out. So this is not just a mute switch to abruptly cut the echo trails in half. I feel this is better for live manipulation and recording. There is a reference manual on the pdf manuals page of this website. Youtube dwarf star stereo delay demo below. This is a passive attenuator modules. You get 7 channels. This is a passive attenuator modules. You get 5 channels. This can also be used as a one-to-five passive splitter. There are also mute switches to turn off or cut the signal. This particular version has a fine feel to the knobs, which allows precision attenuation control. Below is a diagram to help visualize the internal trace layout. Decay Envelope Generator, HI-FI v2164 VCA, and Booster circuit. This module gives you all the tools needed to make kick drums or percussive sounds using your own vco modules that you have lying around. There is only 3 patch points required to connect this to your VCO module. You connect (2) patch cables to your vco cv inputs, and connect the vco wave output into the ASSIST jack audio in. Think of this as a drum maker module for dummies. It makes it idiot proof for you to get 909-ish kick drums easily. The PIEZO jack input allows you to connect drum pads. The ROLAND V_DRUM pad is recommended. Depth: Physical is 2 inches (50.8mm), clearance is 2.25 inches (57.15mm) (ribbon cable included). Current: Ribbon Cable 1 is +92mA/-72mA, Ribbon Cable 2 is +105mA/-92mA. Total expected power draw is: +197mA/-164mA on your system. Oscillator Type: Saw Core generator using Phase Lock Loop (PLL) IC. Exponential CV type: VCA v2164 Exponential converter. PWM: Pulse Width Modulation Input, only effects the Pulse Wave. FM: Frequency Modulation. Linear on this product. MOD: Modulation, Exponential on this product. LOCK: sets mode to use the small trimmer instead of big Tune Knob. FREE: sets mode to use the Big TUNE knob and not the small trimmer. SELECT: refers to trigger input and used to select the wave-forms. The black tactile button is a manual selector. This is a polyphonic true analog vco. There are 4 internal vco's. You get 'one set of controls' for fast, easy polyphonic patch editing. -be 1v/octave controlled and conforms to 'popular' musical note intonation. -can do Frequency Modulation with no harsh aliasing. This is TRUE ANALOG. -voltages to control your other modules. -5v/+5v swing. -polyphonic Pulse Width Modulation. 4 vco possible. -polyphonic sync control with the 4 vco's. -detuned unison sounds by using a mixer module to monitor. -audible 6 wave-forms at once 'switching' patches. -there are calibration trimmers to adjust the four fine tune knobs, and there are trimmers to 'mess up the musical 1v per octave scale'. -digital memory storage or recall. No presets. -Voltage Control Amplifier (VCA), so that the sound stops on the outputs. The user is to have their own VCA modules. -individual outputs jacks for each waveform of each individual vco. That would have been 24 output jacks and too much panel width. You instead get a lazy patching approach, where you use the tactile button to change wave-forms instead of un-patching and picking a wave-form. -(does not have) lfo toggle mode. It can be tuned to go very slow with the tune knob though. Price: $565.00 (Currently available @store page for pre-order, with nice gift). Circuits: +/-5 volt outputs for each axis. Lag Processor and Rapid Trigger. When patched into the axis inputs, the circuit becomes an attenu-inverter. This is the 'FM' portion. This has a separate Lag Processor also. It will delay a gate, and create a lag rising slew controlled with the time knob. There is also a Rapid Trigger output, controlled by push button and rate knob.